Hi Reese, so where ya from & where ya at, Geographically speaking? I grew up in Queens, New York. Currently I’m living in downtown Brooklyn. Lots of hipsters with strollers and prams. There’s always a new artisan cafe or gym about to open. When I saw people in the audience laugh instead of fall asleep. It took a long time to get there though. Also, when people walk out because they’re offended. Obviously, I’d rather people stick around and like the play. What I tell myself is that it’s preferable to total indifference. I hope I’m not being delusional. Which playwrights have inspired you? Chekhov, August Wilson, Caryl Churchill, George Bernard Shaw, Joe Orton, Ibsen. Not the most original list, but each is like their own planet. I can keep returning and never stop finding reasons to love and be fascinated. I also love Simon Stephens, Brian Friel, Paula Vogel, Chris Shinn, Young Jean Lee, Tarell Alvin McCraney, Suzan Lori-Parks. All for different reasons. I’m also inspired by people like Pina Bausch, Ariane Mnouchkine, David Lynch. I could go on. A strong cup of coffee can be very inspiring also. Also, I’m someone who’s in a constant state of excitement over some writer I’m either discovering or re-discovering. Right now I’m obsessing over the Brontë sisters. If I had to choose, I think Emily would be my favorite. What does Reese Thompson like to do when he’s not being theatrical? Watch cat videos on youtube, hang out in bars with friends, try not to feel depressed about the world, obsess. I’m kind of boring. You have poetry in your blood, does this transfer into your writing for the stage? The short answer is yes. I’m still discovering how, so maybe I’ll have a better answer in a year. Also, I was never a good poet. Poetry is so hard. It seems easy because anyone can do, but it’s also hard to be really good at it. What I can say is that years of trying to be good at it has had an influence on how I write. I think poets craft their writing in a very particular way. I also think it trains your ear. So my obsession with rhythm and syllables and word choice are things that have been hammered into me. Even writing a joke requires attention to craft that I don’t think I would have without poetry. I haven’t. This is my first time! I’m very excited! You have written the rather interestingly titled ‘Whore, A Kid’s Play’ which is coming to Edinburgh this August. Can you tell us about the play? It’s definitely a title I have to earn. The play is about friendship and all the ways we become the person we end up being. With the play (and the title), I was trying to capture a time during adolescence when we’re never more innocent and vulgar at the same time. As an adult, someone can call me a fag, a whore, or a chink, and (if there’s no threat of violence) it doesn’t bother me because I know who I am and whether what they’re saying is true or not. But when you’re a kid, you don’t know yourself as much, so being called names can be a bit more scarring. Also, when you’re a kid, everything is so high-stakes. At some point it all amounts to wanting to be a juvenile delinquent of some sort. Why is that? What does the rest of 2017 hold in store for Reese Thompson? I wish I knew what I was doing this afternoon. Probably more writing. Posted on June 28, 2017, in Uncategorized. Bookmark the permalink. 1 Comment. 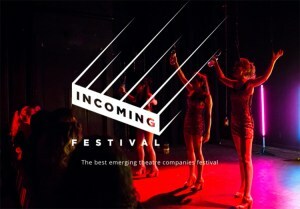 Pingback: Thank you to Mumble Theatre for this interview!